Enhance your outdoor landscaping with outdoor flowering plants in lush, vibrant colors. Annual Poinsettia Sale! Click here to see our Size/Color/Price list. Call (602) 304-0551 to order. 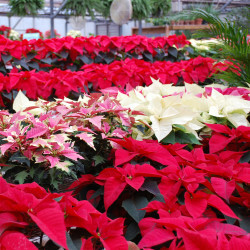 Selecting Your Poinsettia The plant you choose should have dark green foliage. fallen yet low or damaged leaves indicate poor handling or fertilization, lack of water or a root disease problem. The colorful flower bracts (red, pink, white or bicolor pink and white) Should be in proportion to the plant and pot size. Little or no pollen should be showing oil the actual flowers (those red or green button-like parts in the center of the colorful bracts). Christmas Care Be sure the plant is well wrapped when you take it outside on your trip home because exposure to low temperatures for even a short time can injure leaves and bracts. Unwrap the plant as soon as possible because the petioles (stems of the leaves and bracts) can droop and twist if the plant is left wrapped for too long. For maximum plant life, place your poinsettia near a sunny window Or Some other well-lighted areas Do not let any part of the plant touch cold window panes. Poinsettias are tropical plants and are usually grown at temperatures between 60 and 70 degrees F in greenhouses, so this temperature range ill the home is best for long plant life. High temperatures will shorten the file of the bracts Poinsettias do no[ tolerate warm or cold drafts so keep them away from radiators, air registers, and fans as well as open windows or doors. Place your poinsettia in a cooler room at night (55 to 60 degrees F is ideal) to extend the blooming time. Examine the soil daily and water only when it feels dry. Always water enough to soak the soil to the bottom of the pot and discard the excess water. If you don't water enough, the plant will wilt mid the lower leaves will drop. If you water too much the lower leaves will yellow and then drop. If you keep your plant for several months, apply a soluble houseplant fertilizer, once or twice a month according to the manufacturers recommendations. Reflowering If you plan on saving your poinsettia and reflowering it next year, follow the procedure explained below and illustrated below. Late Winter and Early Spring Care Poinsettias have long-lasting flowers - their bracts will remain showy for several months. During this time, side shoots will develop below the bracts and grow up above the old flowering stems. To have a well-shaped plant for the following year, you need to cut each of the old flowering stems or branches back to 4 to 6 inches in height. Leave one to three leaves on each of the old stems or branches - new ,growth comes from buds located in the leaf axils. Cutting the plant back will cause the buds to grow and develop. This cutting back is usually done in February or early March. Keep the plant in I a sunny window at a temperature between 60 and 70 degrees F and water as described above. Fertilize as needed every 2 weeks. Late Spring and Summer Care If the plant is too large for the old pot, repot it into a larger pot. Any of he common peat moss and vermiculite/perlite potting soils sold at garden centers are satisfactory and easy to use. If you want to prepare your own growing medium, use 2 parts sterilized garden soil, I part peat moss and I part sand vermiculite or perlite plus I tablespoon of superphosphate per, pot and thoroughly mix. After the danger of spring frost is past and night temperatures exceed 50 degrees F, sink the poinsettia pot to the rim in the ground in a well-drained, slightly shaded spot outdoors. Remember that the plant may need to be watered more frequently than the rest of your garden. Between 15 and August 1, prune all shoots to about 4 inches, leaving about one, to three leaves on each shoot and fertilize. Fall Care Take your poinsettia plant indoors at night well before the first frost (usually about September 15 in lower Michigan) to avoid chilling injury (this occurs when temperatures are below 45 degrees F for an extended period). The poinsettia can be placed back outdoors in the daytime when temperatures are warm enough or in a sunny window. Fertilize every 2 weeks To reflower your poinsettia, you must keep the plant in complete darkness between 5 p.m. and 8 a.m. daily from the end of September until color shows in the bracts (early to mid-December). The temperature should remain between 60 and 70 degrees F. Night temperatures above 70 to 75 degrees F may delay or prevent flowering. If you follow this procedure the poinsettia will flower for Christmas. 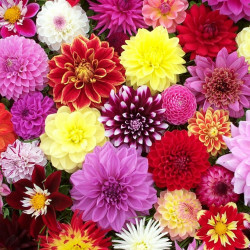 Originally from Mexico, Dahlias are a family of flowering plants with wide variety.....there's a Dahlia for everyone! They grow in size from one to five feet. And, flower heads range from small pompons, to several inches diameter. LIGHTING REQUIREMENTS: USDA hardiness zones: 8 through 10 CARE INSTRUCTIONS WATER: Keep the soil moist but drained, at all times. FERTILIZER: They are big feeders. Make sure the soil is rich and fertile. Add plenty of compost and apply mulch. Low nitrogen fertilizer should be applied regularly all season. FLOWERING: Flowers include single bloom, double bloom and more. If color is what you are looking for, Dahlias are your answer. These attractive plants produce loads of brilliant blooms in rainbows of orange, salmon, bronze, apricot, yellow, crimson, scarlet and lavender. Sorry, there are no no blues. SOIL: Make sure the soil is rich and fertile. DISEASE: Lots of insects love Dahlias. Slugs and sucking insects, most notably red spiders and mites, can be a real problem. Make sure to put down slug pellets or other slug protection on a routine basis. Use insecticides or insecticidal soaps. Disease problems can also occur. If you spot it, treat early with a fungicide. 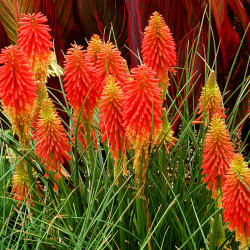 Drought and heat tolerant Red Hot Poker plants are easy to grow. They will do well in mid summer's heat, when other plants have wilted. They are great for arid, and semi-arid areas. You may know Red Hot Poker by another name-it is also called Torch Lily and Poker Plant. They are native to South Africa. LIGHTING REQUIREMENTS: USDA hardiness zones: 5 through 9 CARE INSTRUCTIONS WATER: It is important to avoid wet soils, as the crowns can rot. FERTILIZER: Add a general purpose fertilizer when planting them, then once a month after that. FLOWERING: Flower colors include the ever popular red (of course! ), orange, coral, cream and yellow. SOIL: They prefer loose, rich soil that drains well. DISEASE: Insect and disease problems are uncommon. Striking when in full fruit, ornamental pepper (Capsicum annuum) is a shrubby little plant with a tropical appeal. 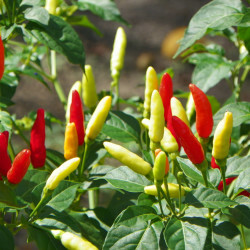 Most varieties that are bred for ornamental use hold their peppers in a upright position above the foliage. LIGHTING REQUIREMENTS: USDA hardiness zones: 2 through 11 CARE INSTRUCTIONS WATER: Water the plants often enough to keep their soil evenly moist. Applying water slowly allows soil to absorb the moisture without letting it run off. FERTILIZER: Fertilize with a slow-release fertilizer early in the growing season. FLOWERING: Bares miniature peppers. These are not eatable. SOIL: Grow in rich, well drained soil. DISEASE: Aphids and spider mites may become a problem. Spray the plants with insecticidal soap or neem oil spray according to the product's label instructions to control those insects. 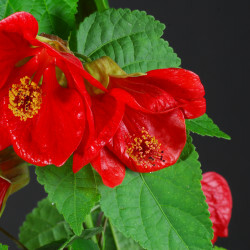 The 'Lucky Lantern' Abutilons are dwarf cultivars of the popular maple-leaf shrub. With bright orange downward-facing lantern-shaped blooms that cover the plant nearly year-round, it makes the perfect container or border accent choice. A tidy 12” x 12” bush with a rounded habit, it needs only one pinch on the center leader to encourage this shape. A fast grower, it loves full sun or partial shade and tolerates drought and heat well. Best in Sunset Garden zones 8, 9, and 12-24, it needs just regular watering. Be on the lookout for birds and butterflies attracted to its many blooms. Abutilon ‘Lucky Lantern Tangerine’ is an excellent accent plant that will provide enjoyment all year. LIGHTING REQUIREMENTS: USDA hardiness zones: 8 through 11 CARE INSTRUCTIONS WATER: Water the plants thoroughly letting the excess water drain through the bottom of the pot. Be sure to keep excess water out of any tray underneath pot. Keep moist, during the spring and summer repeating twice a week all summer long. Water less in winter allowing the soil to dry a little. FERTILIZER: To promote more flowers use a well balanced fertilizer like Roberta’s Flower Magic Plant Food (M7503) once a week April through October. 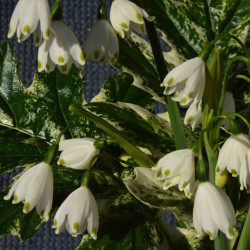 FLOWERING:They will bloom heavily in summer through late autumn. In winter to spring, they will bloom intermittently. SOIL: They like bagged potting mixes for houseplants that will drain well. Most garden centers carry various brand names with perlite, vermiculite, soil and sand. 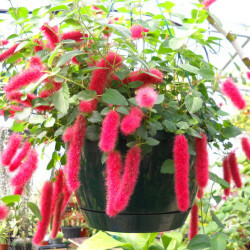 Well suited for a hanging basket, dwarf chenille plant will cascade nicely over a wall if planted close to the edge on top of the wall. This plant makes a good ground cover provided people are kept off of it. Like ivy, it tolerates foot traffic poorly. The small stature and slow growth make it a nice addition to a rock garden or other small-scale landscape design. Dwarf chenille plant performs well in many types of well-drained soils. It grows and flowers best in full sun, with little care other than occasional irrigation needed to maintain the plant once it is established. LIGHTING REQUIREMENTS: USDA hardiness zones: 9a through 11b CARE INSTRUCTIONS WATER: Keep soil evenly moist. Do not let it dry out completely. FERTILIZER: Feed every 2 weeks spring and summer with a high-phosphorus liquid fertilizer diluted by half. FLOWERING: Red, year-round flowering. SOIL: Any well drainable soil will do. DISEASE: There are no diseases of major concern associated with dwarf chenille plants. Scales, mites and aphids may be troublesome pests in some landscapes, especially when plants are grown in partial shade. Handsome, lush, and incredibly lobed leaves that exceed 3 feet in width make this Mediterranean shrub an eye-catching perennial. In sun or shade where temperatures stay above 5°F, this stunner will attract even more attention in the spring and summer when tall purple and white flowers appear along 4-5 foot spikes that last for weeks to months. Give these plenty of room (6-8 feet) and moderate to regular water and they will not disappoint. It is widely accepted that these leaves were the inspiration for the Corinthian column capitols so frequently used in in Greco-Roman architecture and that they are among the earliest known cultivated species. LIGHTING REQUIREMENTS: USDA hardiness zones: 5 through 9 CARE INSTRUCTIONS WATER: Keep soil evenly moist. Do not let it dry out completely. FERTILIZER: Fertilize in spring with a complete organic fertilizer. FLOWERING: Blooms in spring and summer with white and lavender colors. SOIL: Easily grown in average, medium, well-drained soil in full sun to part shade. Tolerates wide range of soils except poorly-drained ones. These hardy, easily grown perennials are perfect for that hard-to-grow spot in your garden. 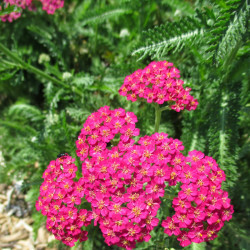 Yarrow are tolerant of drought, wind and heat, Achillea grow well in almost any soil type and are excellent both for fresh cut flowers and drying. Flowers are produced from summer to early fall and the blooms are irresistible to butterflies. LIGHTING REQUIREMENTS: USDA hardiness zones: 4a through 9b CARE INSTRUCTIONS WATER: The media should be allowed to dry regularly between watering and never saturated. However, plants should not be allowed to wilt at anytime. Leach regularly to avoid the buildup of high soluble salt levels. FERTILIZER: Use a balanced fertilizer at a rate of 125 to 150 ppm. Periodic use of a calcium based fertilizer should help optimize the nutrient levels FLOWERING: Blooms in the summer. SOIL: Use media with good aeration and drainage. 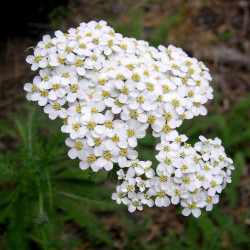 DISEASE: Achillea are relatively disease free. Pythium, and Rhizoctonia can result from over watering. Bold color selection with color retention. Makes a more attractive container plant with no gap between flowers and foliage. LIGHTING REQUIREMENTS: USDA hardiness zones: 4a through 9b CARE INSTRUCTIONS WATER: The media should be allowed to dry regularly between watering and never saturated. However, plants should not be allowed to wilt at anytime. Leach regularly to avoid the buildup of high soluble salt levels. FERTILIZER: Use a balanced fertilizer at a rate of 125 to 150 ppm. Periodic use of a calcium based fertilizer should help optimize the nutrient levels FLOWERING: Blooms in the summer. SOIL: Use media with good aeration and drainage. DISEASE: Achillea are relatively disease free. Pythium, and Rhizoctonia can result from over watering. 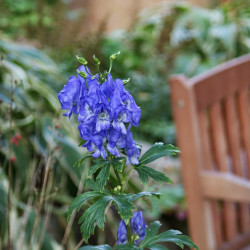 Aconitum napellus is an erect, tuberous-rooted perennial which features dense, terminal racemes (to 8" long) of hooded, deep purplish-blue to violet flowers atop rigid, leafy stems typically growing 2-4' tall. These are commonly found in moist pastures and moist mountainous areas of Europe and Asia. Dark green leaves are deeply divided into 5-7 toothed lobes. The sepals and petals of the flowers are similarly colored, with the upper sepal developing into a large, helmet-like structure that somewhat resembles the hood worn by medieval monks, hence the common names of monkshood and helmet flower. Also sometimes commonly called wolfsbane because this plant was once used as an arrow poison and in a poison bait for killing wolves. All parts of the plant (especially the roots and seeds) are extremely poisonous. The drug aconite is made from the leaves and roots of this species and was once prescribed as a cardiac and respiratory sedative. LIGHTING REQUIREMENTS: USDA hardiness zones: 3 through 7 CARE INSTRUCTIONS WATER: Best grown in moist, organically rich, well-drained soils. FERTILIZER: To promote more flowers use a well balanced fertilizer once a week April through October. 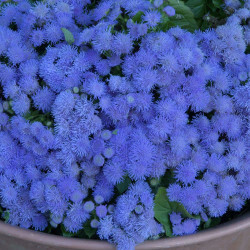 FLOWERING: Blooms July through August with deep purpleish blue flowers. SOIL: Use well drainable soil. DISEASE: No serious insect or disease problems. Crown rot, powdery mildew and verticillium wilt are occasional problems. WARNING: WEAR GLOVES WHEN WORKING WITH THIS PLANT. Avoid skin or oral contact with plant juices, and be particularly careful to cover up any open cuts or skin abrasions prior to entering garden areas. 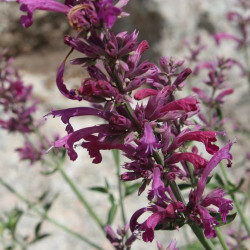 Thirty species of aromatic perennials make up this genus. They are known for their long-lasting flower spikes and ability to tolerate heat and early frosts. Hummingbirds, bees, butterflies, and other insects love them. Some are native to the U.S. LIGHTING REQUIREMENTS: USDA hardiness zones: 6 through 9 CARE INSTRUCTIONS WATER: Water the plant lightly immediately after planting, providing just enough moisture to saturate the roots. FERTILIZER: Apply a balanced, all-purpose fertilizer every year in early spring. Apply the fertilizer at the rate suggested on the container. Water deeply after fertilizing to prevent burning the roots. FLOWERING: Blooms in warm temperature. SOIL: Use well drainable soil. DISEASE: Generally trouble free, but mildew and rust may affect leaves in dry weather. Downy mildew and other fungal leaf diseases are less common. Floss flower is a frost-tender annual of the aster family that provides continuous bloom for beds, gardens or containers from late spring to frost. Features fluffy flowers (basically asters with ray flowers absent) in flattened to slightly rounded clusters atop compact, mounded plants generally ranging from 4” to 18” tall. Some taller varieties (e.g., the triploid ‘Blue Horizon’) are more erect and grow to as much as 30” tall. Species flowers are medium blue, however many cultivars are available in commerce in various shades of blue, pink, red, white and bicolor. Leaves are typically rounded, cordate-at-the-base, hairy, slightly quilted and soft green. Taller varieties make good cut flowers. LIGHTING REQUIREMENTS: USDA hardiness zones: 2 through 11 CARE INSTRUCTIONS WATER: Do not let dry out for too long. Keep soil moist. FERTILIZER: Refer to growers instructions. FLOWERING: Blooms June to frost. SOIL: Prefers rich soils with good drainage and consistent moisture throughout the growing season. DISEASE: No serious insect or disease problems. Watch for aphids and whiteflies. Powdery mildew is an occasional problem, particularly in hot and humid climates where soils are kept on the dry side and air circulation is poor. Root rot may occur in poorly drained soils. Taller plants usually benefit from some support.